”In September last year a group of people from across Australia gathered in Alice Springs to mark 50 years since the lease was first signed for the Pine Gap US military intelligence base. Most people don’t know much about this facility just south of Alice Springs, and for good reason – the base and what it does has been intentionally kept secret. But over the years it has been used to gather intelligence for the CIA, NSA and the US military; as part of the US nuclear weapons program; and used to target unmanned drone bombings. 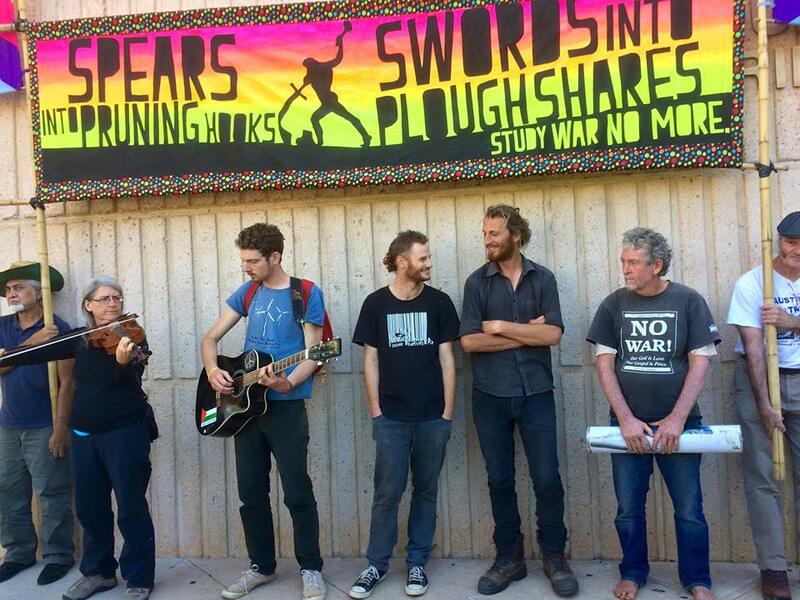 A group of six of us – Jim Dowling, Margaret Pestorius, Paul Christie, Andy Paine, Tim Webb and Franz Dowling – decided a way to bring attention to Pine Gap and what it does was to walk on to the base as “peace pilgrims” – carrying musical instruments and an image from the US war in Iraq to lament the death and misery caused by Pine Gap.